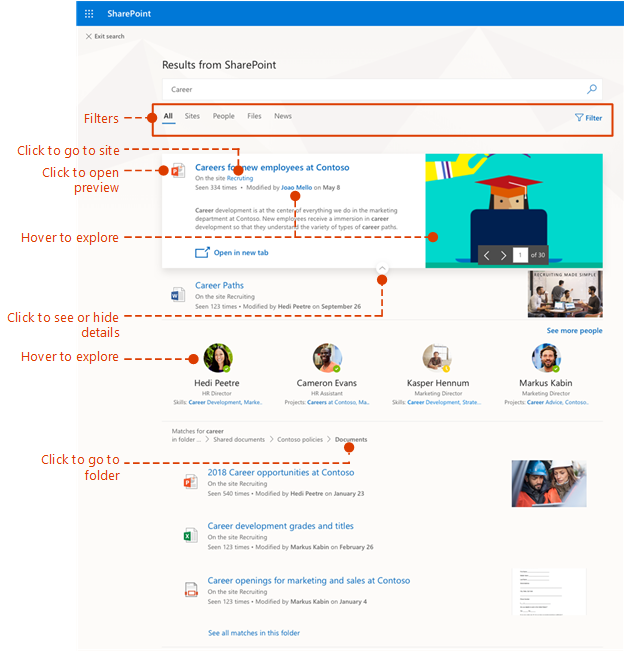 In SharePoint Online and on office.com, search is personal, and the search results are even easier to explore. Another user will see different results than you, even when you both search for the same words. You'll only see results that you already have access to, and other users can’t find your private documents. Even before you start typing, you'll see results based on your previous activity in Office 365. The results update as you start typing. Explore the search results to see more details about the people and files you've found, or refine your search to get other results. Here’s an expert tip to quickly see more, or less, details of a result - you can actually click anywhere in the empty space of the result. 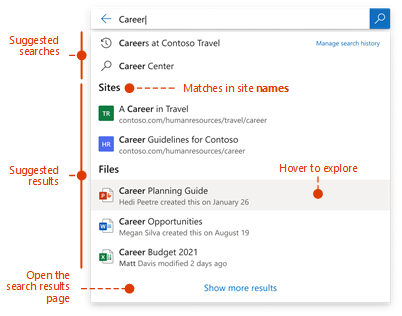 You can navigate to locations that you want to explore further and, if you've searched in SharePoint Online, you can change where the results come from. For example, if you searched from a site, but really meant to search all of SharePoint, then you’re just one click away. Or, if the site you searched from is associated with another site, but you want to search all the associated sites. When you exit a search results page, you return to the page where you started your search.